A date for your diary! 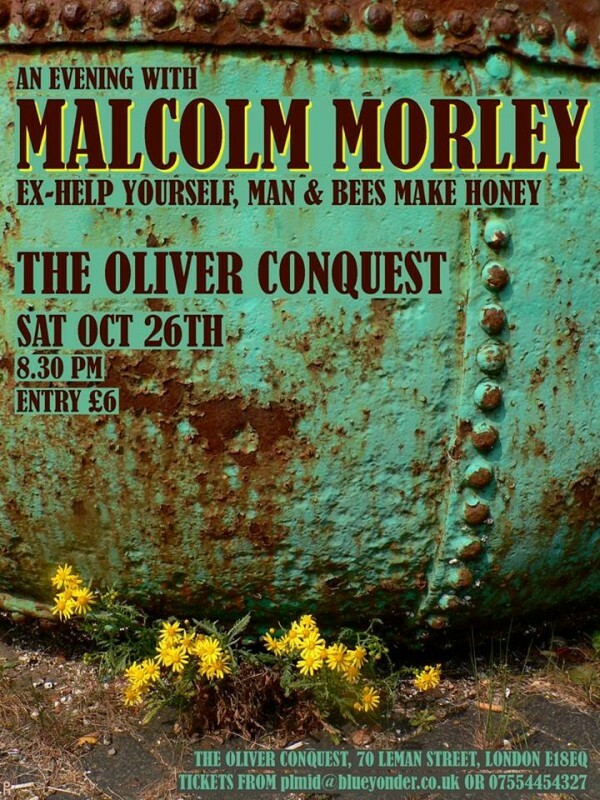 ~ Saturday October 26th 2013, when I’ll be playing a gig at the wonderfully-named Oliver Conquest at 70 Leman Street, London E18 EQ. Tickets are priced £6 and the gig starts at 8:30pm ~ hope to see you there! Many thanks to Richard Gould for this kind review. Did anyone take any photos at the gig? Well, forget about “Malcolm In The Middle” – we were regally treated to “Malcolm In Our Midst” on Saturday night. Not that those in attendance needed any proof, but we duly received 12 “Reasons To Be Cheerful” in the very same week that Charterhouse Square, Farringdon gave up its secret of plague burial. It must have been a pleasing sight for Our Malc as he surveyed the gathered souls in the intimacy of the Cellar. A pleasing and very apt degree of reverence was shown by those souls – All drawn by the one desire – to hear one of this country’s great under-appreciated (venerated ?) singer-songwriters. Anyway, as I was saying, we were treated to yet another thoroughly entertaining set from Malcolm – altho’ it must be said on somewhat of a “reverse running order” Bill O’ Fare. Maybe he was savvy to know that he would be the “pull” anyhow. His self deprecating humour was present in abundance alongside his singing and playing. Maybe because he only played for about an hour but, I found myself wishing it was going to be a repeat of his Sunday Afternoon Triumph @ The Constitution back in last October. A small gripe all things considered, plus he also delighted us with an instrumental “California Silks & Satins” – perhaps given the age of the audience he could rename it “California Pills & Statins” ? The set’s combination of covers and originals was a good mix. The covers benefit from hardly being yer bog standard ones too ! Opening with a traditional American song known by many a title, “Green Back Dollar”, sets both the tone and the bar for what ensued, a standard that was maintained throughout. The two standout items for me were two of his own compositions and I know that I am far from being alone in hailing both “Summer Lands” and “Where The River Bends” as some of the strongest material he has written. There are some others too but, they were not aired on the evening. We were also treated to a work-in-progress in the shape of “The Devil In Me” that also bodes well should he ever feel inclined to deliver a full album of new material. His encore with “The Shade” from the misunderstood in some quarters “Aliens” was an interesting reworking. Mild Mannered Man that he is, Malcolm had to be prompted that he had a new 2 track CD to plug. Even then he politely avoided divulging its contents – namely a “band” arrangement for “Perfect” (Perfick indeed ! – Away with you and your Pa Larkin vocabulaire – Essex or Kent ? It must be an Estuary Thing !) plus an interesting reworking of “Candy Cane”. A nice touch on the sleeve – credits to the “Fabulous Middleton Brothers” (does that make Kim, Michelle Pfeiffer ? ), Tony Smith and Nick Ring (nice to see “Alfie” in on the act too! ), and Tim Mayne. There’s a network of sincere people about him that should inspire him to keep going. So as not to overlook “Roadhouse”, who followed Malcolm, they played a cracking set of covers with some neat arrangements on standards. A great vocalist / harp player, a very tasteful guitarist, a great female bassist and vocals, all topped off with a “more than able drummer”, plus some great harmony vocals. A convincing take on Robert Johnson’s Come Into My Kitchen” was followed by a couple of Bill Withers songs. The sombre “Use Me” and “Ain’t No Sunshine”. They wrapped up the proceedings with the Anthony Newley / Nina Simone “Feeling Good”. Live gig in London in October! Great news! 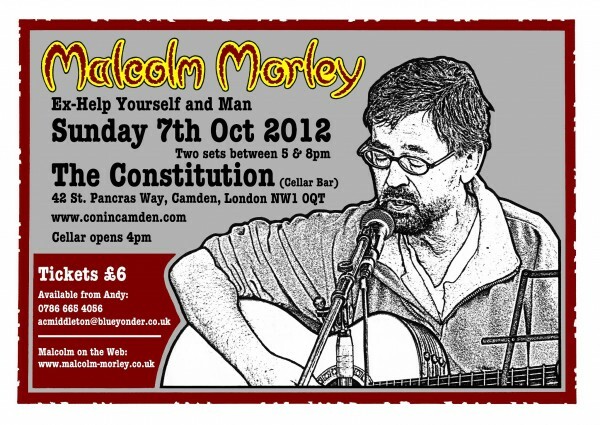 Malcolm is playing a gig in London on 7th October ~ a Sunday evening. Hope to see you there… and if you can’t be there, we’ll report back with pics and a review of the gig itself. Added to ARCHIVE, NEWS | Comments Off on Live gig in London in October! 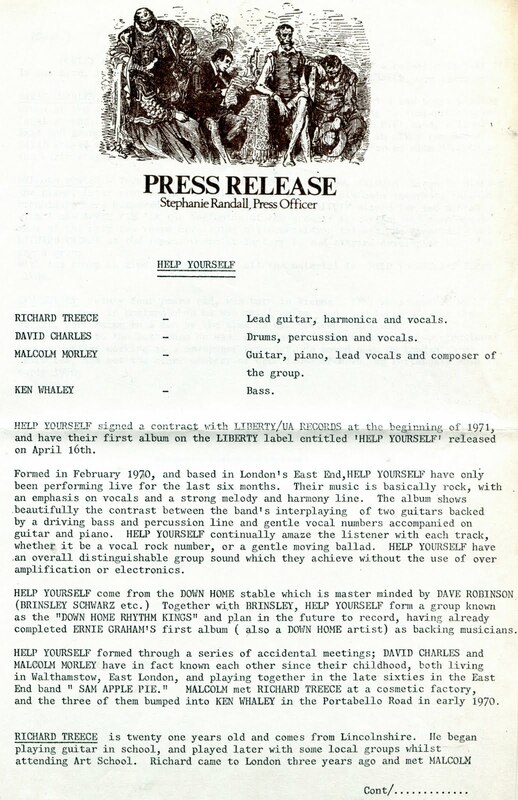 A Help Yourself single recently sold on eBay for £21.99. Wow! 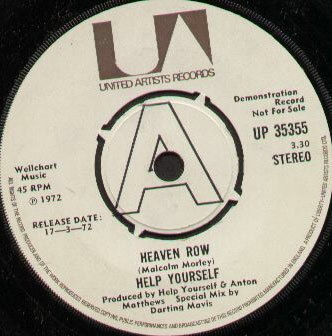 I should add that this particular single was a demo copy of Heaven Row / Brown Lady… nevertheless, it’s a startling price. Wonder how many of these there are about? 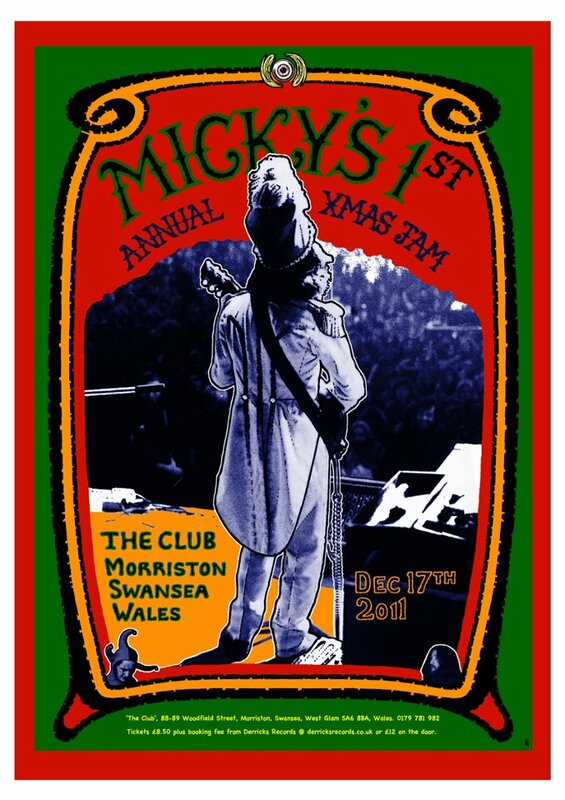 It is with great regret that owing to a hospital appointment I have to announce it is is looking unlikely I will be able to make it down to Swansea to play at Micky’s Xmas gig. I had so wanted to play at the event but recent events have conspired against me. There’s still a tiny chance I may be able to make it, but I must stress that it is just that… tiny. I will however be there in spirit whether I make it to Swansea or not! The gig looks as if it is all set to be a great event, I was especially looking forward to seeing Micky’s son George play… something I have not yet had the privilege of doing. I wish the event all the success in the world and should it become a regular event, I’m sure I will be appearing in the future. IMPORTANT! ~ Please see latest post on this event. Should be a great night. Hope to see you there! I’ve been told that the Betsey has hosted gigs from the likes of Keane, The Magic Numbers, Editors, Guillemots – and more recently Jack Peñate and Kate Nash. Well now they’re going to add Malcolm Morley to that esteemed list! The gig is confirmed for saturday 11th June – from 8pm to 11pm. 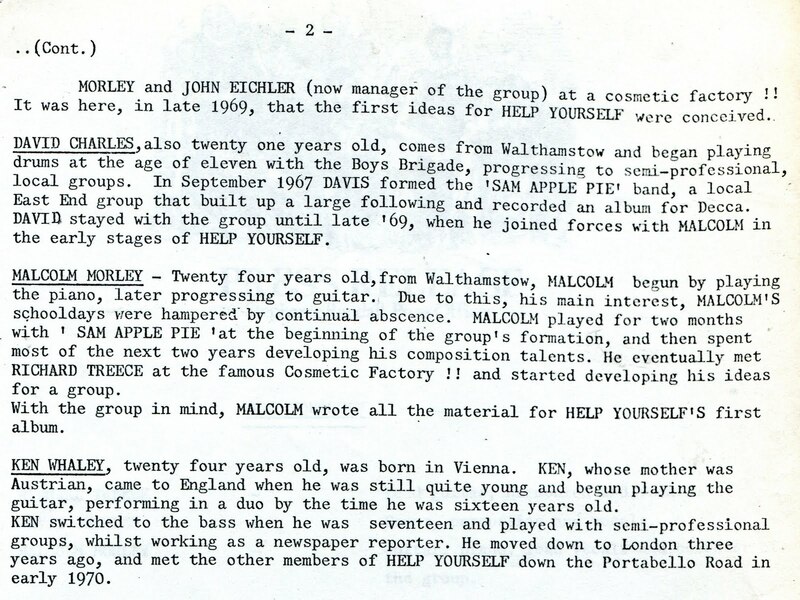 Malcolm expects to perform ‘Love, the Mystery and the Flame’,’ Perfect’, ‘Vanilla Sky’, ‘Blown Away’, ‘Looking for You’, ‘Where the River Bends’and possibly ‘Candy Kane’ among other songs. Apart from Blown Away, the new material is currently in the process of being recorded and will be available soon. Candy Kane and Perfect being the first – click here to hear them. In addition to Malcolm, Max Muller will be making his debut appearance in the UK. Max is a folk/blues oriented singer and songwriter. In Malcolm’s own words, he is “quite a hot guitarist”. For further details on the venue, please click here. Here’s another fantastic item courtesy of John Bannon – a spread from the 1974 Buxton festival programme. Man played on the first day of the festival, on the 5th of July. 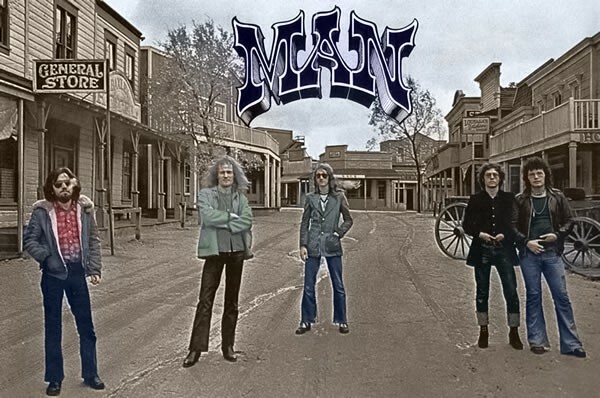 Man played just before Mott the Hoople, who were the headliners on the Friday night. The Festival was headlined by Rod Stewart and The Faces on the Saturday night. An advert for the festival is below which shows the full line-up. If you’d like to read more about the Buxton Festivals in the 1970s, visit this site. I’ve been beavering away writing some new songs, as well as re-intrepreting an old Help Yourself favourite. I’d love to know what you think ~ have a listen by clicking here. Malcolm Morley Manband memory fail! Hopefully someone can help. I’ve been asked about the poster below (yes, yes, I know the size of the turn-ups on my jeans is extraordinary… I don’t know what I was thinking either!). Where did the poster originate from? 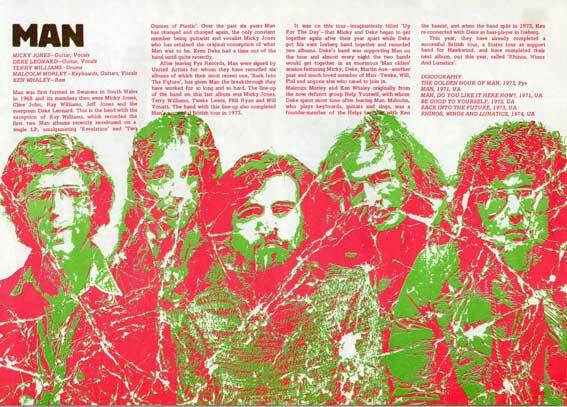 I can’t remember whether it came with an LP ~ Rhinos, Winos & Lunatics? But I don’t think so. I vaguely recall the shoot ~ a film set possibly. Anyone know? I’ve been sent these old press releases. Hopefully, you can read them – I’ll get round to typing them at some point.